Ok, I have been going on endlessly about Fall for so long that you all knew this was coming. In honor of the official start of all things pumpkins, I am busting out old and new copies of my Fall magazines for inspiration and my box of Fall decor and browsing the internet for ideas as well. We have been blessed with beautiful fall weather here today, cool and overcast, which makes it even better to do all things Fall-ish. I have been simmering a creamy vegetable chowder with bacon since ten a.m. I just had my first bowl for lunch. The five year old told me it was "the best fall soup". Yes, I am starting them young. Also rising on the counter right now is Mom's Homemade Bread. My mouth is already watering. And just for fun here, are some other ladies from around the web who are just as excited about Fall as I am! Grab a cup of apple cider, a warm muffin and a cable knit throw. Wrap up and click around for some fall inspiration! Love how she uses what she has to make the transition to Fall. I have been coveting this couch for longer than I care to admit. This lady has got the touch for all things comfy and beautiful! I just recently discovered this lovely home and she is hosting a fabulous Fall Home Tour! 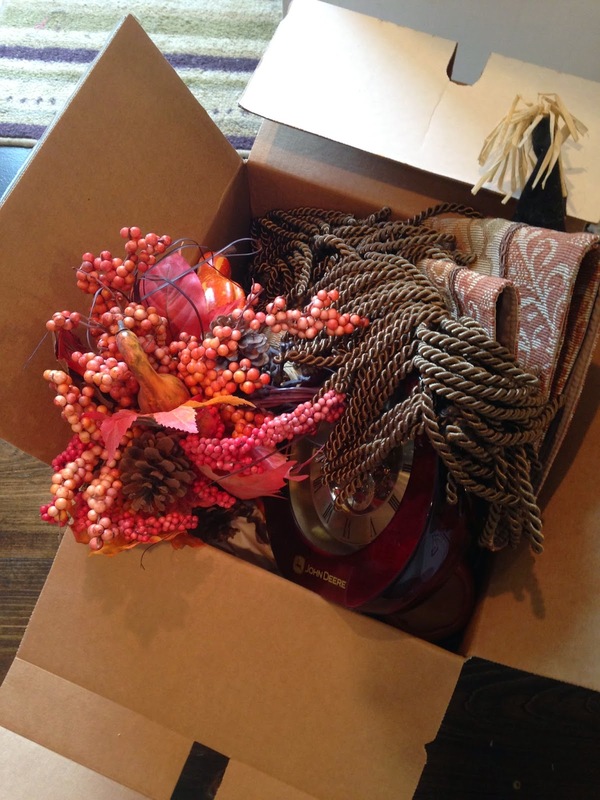 I am off to go put pumpkins and gourds in random places around the house, and make it look like Autumn up in here! I hope you all have a wonderful first day of Autumn! Enjoy! P.S. Do you call it Autumn or Fall? I can't decide, so I am using both!